Born Shanghai, 1937. Died Tanzania February 1950. 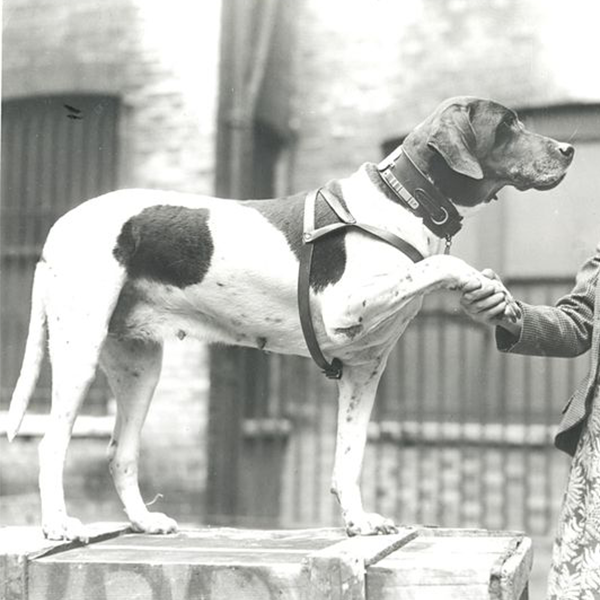 Judy is the only dog to be officially registered as a Prisoner of War. 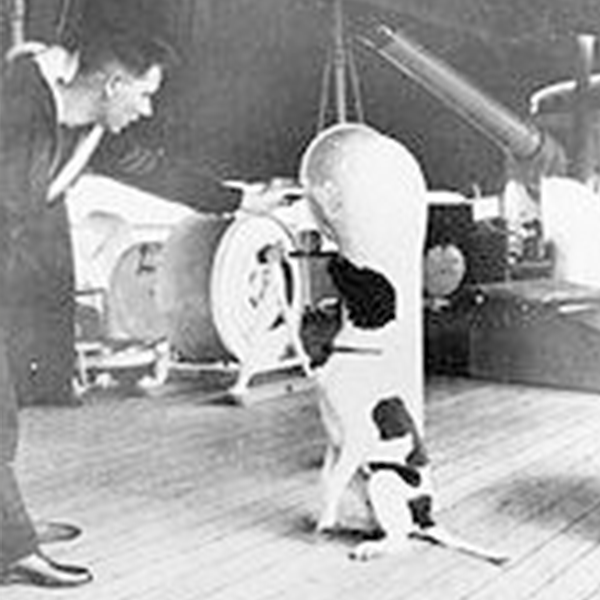 Judy, a pure-bred, liver-and-white English Pointer, was gifted to the Royal Navy as ship’s mascot and began her Naval career aboard HMS Gnat and then her sister ship the river gunboat, HMS Grasshopper. By some miracle Judy survived enemy attacks on both ships and then, in February 1942, as she accompanied the survivors of the Grasshopper on their daring trek to safety she was taken prisoner and began a three-year sentence as a Japanese Prisoner of War in the steaming jungles of Sumatra. Every day in the camp at Rengat, Judy’s life was at risk from disease, starvation, thirst and detection by the Japanese guards. The men of the Grasshopper regarded their mascot as their ‘guardian angel’ as she had sniffed out a life-saving fresh-water spring on the island where they had been forced to abandon their stricken ship. From that moment they made it their duty to protect her by sharing the little they had and no matter how great the risk. Hiding Judy under a pile of rice sacks, the men assured her safe transfer to the prison camp in Medan. 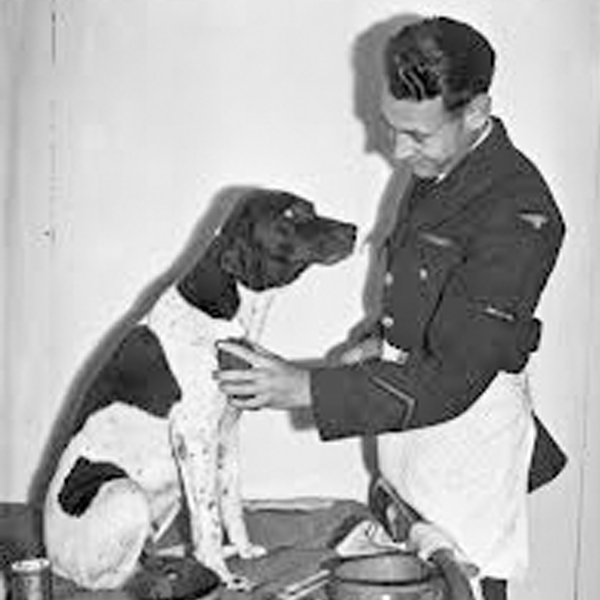 It was then August 1942 and six-months of scavenging for food and water had already taken its toll on Judy: her ribs were showing through her skin and she, like the men, had a haunted look, but despite all the depravations she managed to retain a shadow of her English Pointer bearing. Judy was determined to survive and that spirit in the dog inspired her fellow prisoners to keep going too. It was at Medan that Judy came face-to-face with the man who would become her master and life-long companion – Leading Aircraftsman Frank Williams. One day he held out his hand and offered her his ration of rice and from that moment she never left his side. Judy was a friend and comfort to all the prisoners, but the Japanese guards were becoming increasingly hostile towards her. She never failed to intervene and cause a distraction when the men were being beaten. She barked at nipped at the guards’ heels and Frank was well-aware that Judy needed a new and more robust level of protection if she was to survive much longer. Somehow, the Airman managed to persuade the camp Commandant, Colonel Banno, (while he was enjoying a glass or two of Saki) to register Judy as an official Prisoner of War. It was an inspired idea and so it was that Judy’s name joined the register with part of Frank’s own number to become: PoW 81A Gloergoer, Medan. The comfort this brought to Frank was not to last. By June 1944, the men were on the move – and Judy too. Colonel Banno was transferred out of the camp and Captain Nishi arrived bringing with him a huge capacity for cruelty. He hated dogs and immediately issued strict instructions regarding Judy: the men were moving camp, but Judy was to be left behind. There was no way that Frank and the others were going to abandon Judy to an unknown fate. By perfecting a series of low whistles and hand signals Frank communicated with Judy making it possible for her to join them on the transfer journey on the commandeered Dutch merchant steamer, the SS Van Warwyck. Man and dog rehearsed their part in loading Judy in and out of rice sacks and remaining still and quiet. Judy didn’t move a muscle or utter a sound even when the Japanese guards made the prisoners stand on parade for hours in the tropical heat. Little did they know that Judy was in a sack over Frank’s shoulder all the time. Only a day into their journey, on 26 June 1944, the Van Warwyck was hit by a torpedo and in the chaos the only possible chance of escape for Judy was through a 10-inch porthole. Frank pushed her out and then joined his colleagues in the crush to exit. Once in the oily, burning water, Judy lost contact with Frank who spent hours swimming around looking for her and days after hoping she would just reappear in his life – as she always did. He had already lost many friends, he did not want to lose Judy too. As the truck drew-up outside River Valley Camp in Singapore Frank looked around hoping his dog would be there. Suddenly, something hit him square between the shoulders. It was Judy, covered in oil and eyes burning red. By all accounts it was an emotional reunion. Survivors of the sinking told how they had seen Judy bring people ashore by letting them hold onto her body: as she delivered one, she returned to the water for another. She was finally rescued by one of the men who plucked the exhausted dog from the sea and kept her safely hidden during the journey to the camp. Judy had one more bit of luck when she reached the docks: her nemesis, Captain Nishi, saw her being hoisted from the boat onto a truck bound for the new camp and ordered her to be dropped into the sea. A loud voice boomed out to over-rule him – it was Colonel Banno – and Judy PoW 81A Medan was lowered to safety. Over the next year Judy and Frank were shunted from camp to camp as the prisoners were used as a workforce laying 3,000 miles if railway track through the central Sumatran jungle. Each move was carried out with Frank using a series of well-rehearsed whistles and hand signals that Judy understood and obeyed. But each move focussed attention on Judy who, by now was a key target for the guards. She hated them, and the feeling was mutual. To keep her safe during the day, while the men worked, she lived in a section of jungle just beyond the camp fence where she explored and caught her own food. At night, if it was safe, Frank called her into camp with a low whisper of her name and she would often return with a ‘gift’ of a dead animal such as a monkey or, one time she presented her master with an elephant’s shin bone – and then spent all the next day trying to bury it! She warned the men of dangers such as approaching crocodiles, tigers and scorpions. And learned the hard way that crocodiles bite. Judy was no longer the timid, mild-mannered dog that Frank met in 1942 she was now a wily, street-wise, survivor. At Medan she had a litter of puppies and had to suffer their loss and the violent death of their father. Every day in captivity her captors held a death sentence over her, but she didn’t give in. Death and disease were at every turn and Frank worried what would happen if he died and Judy was left alone. So, he stayed alive for her. Although Victory over Japan (VJ Day) was celebrated on 15 August 1945 news of peace in the Pacific was slow to reach the prisoners of war in Sumatra. Food parcels were getting through, thanks to the RAF, but transport home was taking time to organise. Frank, and the other prisoners, was taken to the military hospital in Singapore where he recovered well with Judy at his side. It was a taste of freedom, but Frank’s thoughts were already turning to the final challenge – smuggling Judy home on the troop ship. It seemed ironic that after three years as a Prisoner of War Judy could be denied safe passage home. The SS Antenor waited alongside and on the gangway a notice, placed by the authorities read: ‘No animals allowed’. Not one of the prisoners was going to allow Judy to be left behind. Many knew that they owed their life to that dog. For one last time Judy was a stowaway. Using a series of signals, distractions and a perfect hiding place under Frank’s bunk the men managed to keep Judy a secret for three days by which time the ship was in open water and well into her 10-week stretch to Liverpool. She roamed the troopship visiting everyone as she did when she was the Grasshopper’s ship’s mascot and friend to the prisoners in the camps. Lucky for Judy that the cook was a dog lover so of all her new haunts, the galley became Judy’s favourite place to visit. 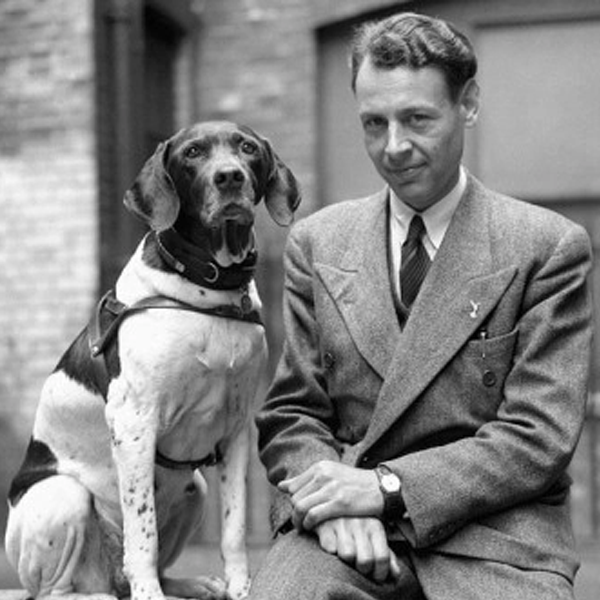 Soon, the skinny dog’s story was well-known to all aboard and admiration for the brave PoW dog who kept morale high and the men alive grew and grew. When Frank was faced with the reality that Judy could be denied permission to leave the ship at Liverpool the men rallied round with a plan to thwart the authorities. Support for Judy was overwhelming. She had come so far with the men, no one was going to abandon her now. Many of the PoWs sent messages requesting support for Judy and in the end, it was one of Frank’s RAF colleagues used his family connections to pull a few necessary strings and Judy’s freedom to step ashore was secured. Frank new that the quarantine officials would be waiting to take Judy from him when they disembarked but he wanted to take her to visit one special place before they had to part – the NAAFI canteen. Faced with a plate of cream buns Judy could not resist making the best of her first shared ‘meal’ on home shores with Frank. It was a far cry from her old camp diet of grey, maggot-ridden rice. It was a week before Frank was able to visit Judy in the quarantine kennels in Surrey. Judy hadn’t understood Frank telling her to go with the officials, but he had no choice. They couldn’t hide any longer, but that didn’t make the parting any easier for man or dog. Judy wasn’t eating and being locked away in a kennel, when she was no longer a prisoner, must have been the loneliest time of her life. Frank kept his promise to visit Judy every week and over the six-months quarantine period she began to eat the food she was offered and re-gained her weight and strength just as Frank did back home with his mother and sister. On the day of Judy’s release, the world’s press was ready and waiting to welcome home a hero dog. 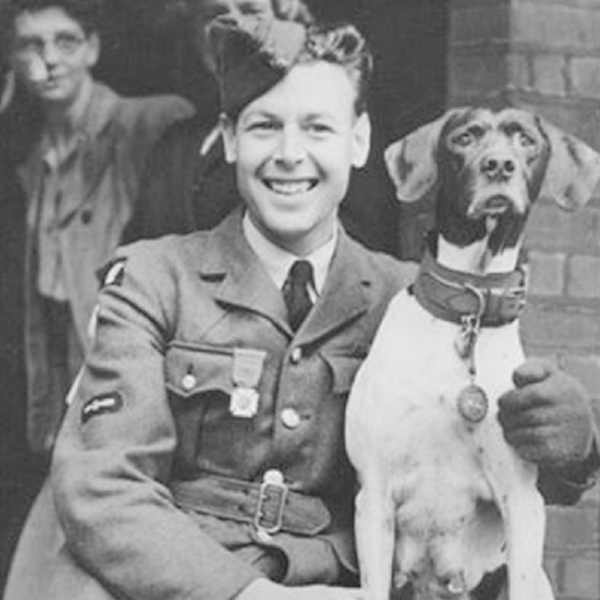 Judy was awarded the PDSA Dickin Medal – the animal’s Victoria cross – in May 1946. Her citation reads: “For magnificent courage and endurance in Japanese prison camps, which helped to maintain morale among her fellow prisoners and also saving many lives through her intelligence and watchfulness.” The presentation took place at the Returned Prisoner of War Association headquarters in London where the Chairman of the Association, Viscount Tarbat, referred to Judy’s determination to protect Frank and other prisoners and so awarded her a life membership – a first for a dog. Once again Frank said he owed his life to the ‘old girl’ – many of the men said the same. On 8 June 1946, Judy’s bark was broadcast worldwide by the BBC as part of the Victory Day celebrations. She became the first dog to bark live on air! 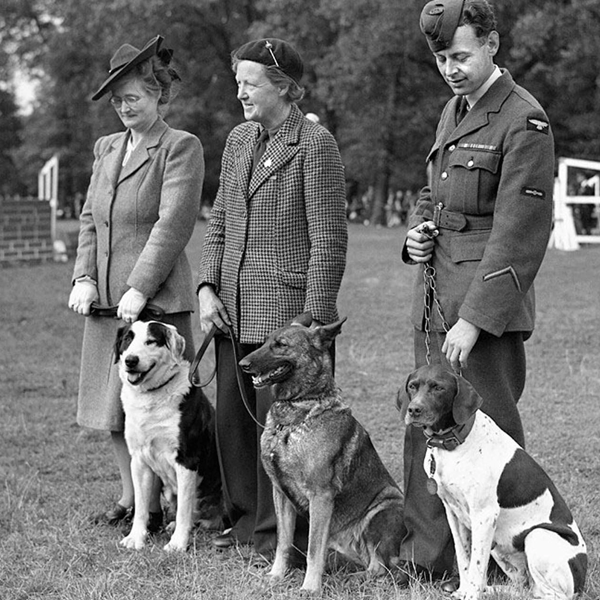 As poster-girl and war dog Judy attended many events to raise money for animal and children’s charities and as a returned prisoner of war she accompanied Frank on visits to families who had lost a loved one in the camps. Judy’s presence always brought a unique comfort at such difficult times. On 22 July 1946 Frank and Judy were de-mobbed from the RAF. Judy had swapped her role of Naval mascot for RAF mascot when Frank adopted her in the camp in Medan and now she was going to start a new life with him in Civvy Street. East Africa. In 1948, Frank and Judy left Britain for East Africa to join a Government scheme which required Frank to be based in what is now known as Tanzania. They settled into their colonial home and Judy appeared to take well to a return to part jungle life. She protected Frank and his colleagues from snakes and other deadly wildlife, challenged baboons, chased monkeys and managed to have a litter of nine puppies. For two years Frank and Judy enjoyed their new life together. Until the day Judy went missing. After a huge search organised by Frank she was discovered nine-days later in a hut where local people had been caring for her. She was very ill and although surgery for a tumour was successful, her period of recovery was short-lived. On 17 February 1950 Frank made the agonising decision to have Judy put painlessly to sleep. She was laid to rest in a grave fit for a hero, marked with a brass plaque detailing her life’s achievements and her devotion to Frank and all who knew Judy – Prisoner of War 81A Gloergoer, Medan.